Maxforce® White IC Cockroach Gel is a professional use only cockroach killer gel, ideal for use in commercial kitchens and residential situations. The powerful and fast-acting gel delivers outstanding results within 24 hours. 30g will treat an area up to 300 sq m. Pack of 4 x 30g gels . PROFESSIONAL USE ONLY. Maxforce® White IC Cockroach Gel is a professional use cockroach killer gel, ideal for use in commercial kitchens and residential situations. Pack of 4 x 30g gels. 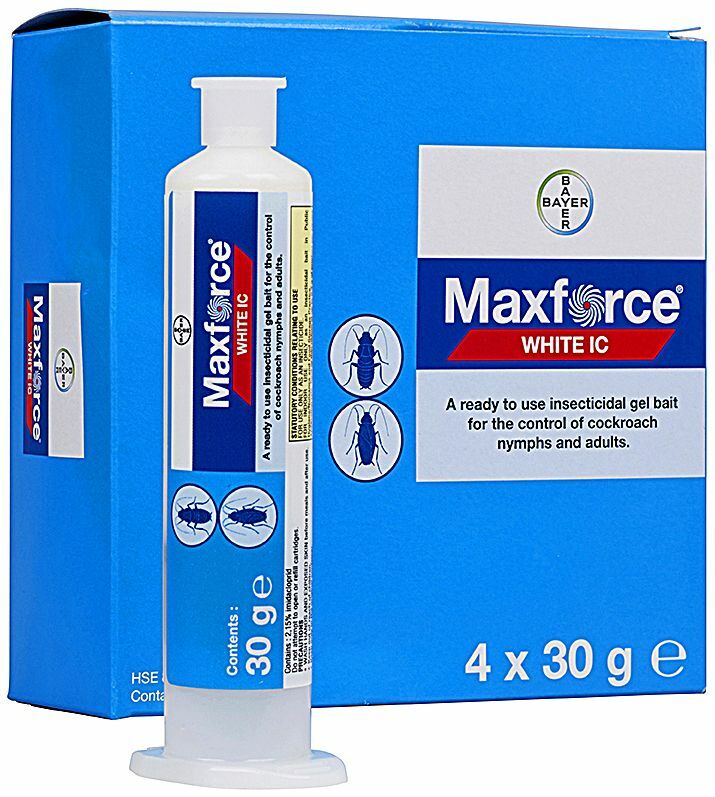 Maxforce® White IC is the first choice of treatment for professional pest control technicians with recent improvements to the formulation making Maxforce® White IC even more powerful. This powerful and quick-acting cockroach killing gel delivers outstanding results with maximum control achieved within 6 days of application, although many cockroaches will die within 24 hours. Maxforce® White IC contains imidacloprid, an insecticide known for its rapid knockdown effect, killing cockroaches within an hour following ingestion of the gel. Imidacloprid also works through an effective ‘domino effect’, remaining cockroaches are killed through secondary poisoning after feeding on the dead cockroaches from their group. Maxforce® White IC is particularly suited for treatments in commercial kitchens (such as restaurants, takeaways and food processing plants) due to its ease of application and ability to withstand temperatures of up to 54°C. The gels effect is long-lasting as it does not dry out, remaining palatable to cockroaches for an extended period. As no special preparation is required prior to application, minimal disruption is caused to the user as the area does not need to be vacated during or after treatment. Each tube contains 30g of cockroach gel and will treat an area of up to 300m2. Apply one spot of gel, roughly 2cm in diameter, every 1m. For best results, we recommend using one of our Applicator Guns to apply the Maxforce® White IC as this will help you achieve a professional application of the gel. NB: THIS PRODUCT IS FOR PROFESSIONAL USE ONLY. BY ORDERING IT YOU UNDERTAKE THAT YOU ARE EITHER PROFESSIONALLY QUALIFIED OR YOU WILL CONTRACT A SUITABLY QUALIFIED PERSON TO APPLY IT. This Applicator Gun enables quick, easy and precise application of the Maxforce® White IC Cockroach Gel. As used by professional pest control technicians for conducting cockroach treatments. The Applicator Gun dispenses the correct amount of gel every time.